Choosing a retirement home is an incredibly important decision, and isn’t one that should be made lightly. It may be a decision that you don’t want to make at all, and that’s understandable. But at Rawlins County Health Center, we aim to create an environment and a space that you would be excited to call home. 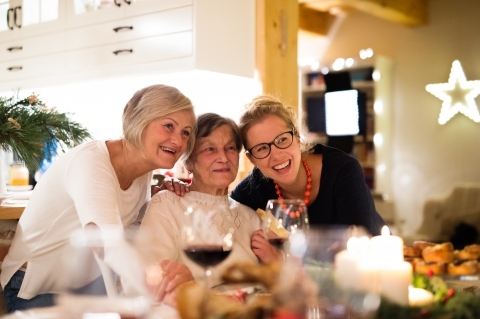 If you’re looking for a retirement home for yourself or for a loved one, here are some of the top tips for choosing a home that you will love. Choosing a retirement home is similar to looking for a home to buy in that one of the most important factors is the location. Not only the immediate surroundings, but also the amenities that are in the area, proximity to family, kids, and grandkids, and also how fast you are able to get to a medical center. Living in a retirement home doesn’t mean that you lose all sense of independence, so it’s important to have access to entertainment, people, and services. In addition to independence, seniors should also be able to easily socialize with other people. Depending on your needs and desires, look at the layout of the community, how many residents live there, and if there are any community areas where people can gather and talk. This may not be on the top of your list, but if you choose a community based solely on services and staff, but there are only 20 residents, you may end up feeling lonely. This is quite possibly the most important factor when choosing a retirement home. Get to know as much as possible the types of services and care that they provide, and if they have specialty services that you may need, such as a health clinic. Ask questions about meals, in-home care, dementia care, if they offer help with medication. Make a list of questions and requirements that you have before scheduling a time to visit. The nurses, doctors, and even administrative staff can have a big impact on the culture of a retirement home. Make a point to visit the community during different hours of the day so you can interact with the various staff. Ask if you can sit down with some of the staff to get to know them and ask what they enjoy about the community. And most importantly, ask management what qualifications are required to work there, what training they get, and if they offer any continuing education. The care that you receive from the staff should be a top priority. 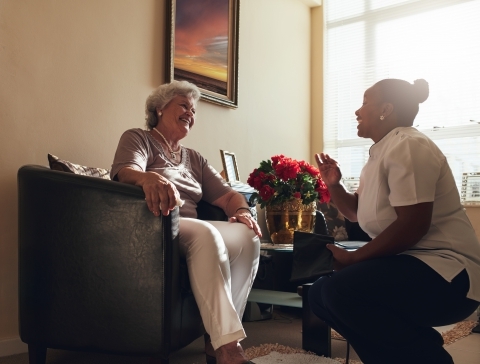 The price is a significant concern for many who are choosing a retirement home, so be sure to get specifics about how or if they will work with your insurance company. Ask for a detailed breakdown of what their costs include, as well as any fees. You may also want to speak with your insurance provider to make sure you have a clear idea of the full cost. What activities does the community offer? Is there entertainment, such as restaurants, movie theaters, and shopping in the area? Is there a clubhouse where family can come visit? Are there scheduled events? Find a retirement home that suits your personality as well as medical needs. Rawlins County Health Center has a retirement home, Prairie Plaza, that is minutes away from our health clinic. If you’re looking for a home that has top medical care, a beautiful surrounding, and fully equipped apartments, you’ve found the place! Get in touch with our team today to learn more or to schedule a tour. The Rawlins County Health Center (RCHC) publishes a monthly newsletter with current information about our hospital, clinics, and community. Advances in breast cancer prevention and treatment have come a long way since our mother’s or grandmother’s days; however, according to Susan G. Komen women in the U.S. have a “1 in 8” lifetime risk of getting breast cancer. Whether or not a woman gets breast cancer is largely out of her control, as risk factors include family history, lifestyle, reproduction, and the environment. Knowing that getting breast cancer is largely out of your control makes it even more important to take getting regular screenings seriously. When breast cancer is caught early on, there is a much better chance of the cancer being treated effectively before it becomes serious and even life-threatening. At Rawlins County Health Center, we offer a range of diagnostic services, including mammography. Our hospital uses the latest technology to get a better picture of the breast tissue in order to help our physicians make a more accurate diagnosis. For women who have never had a mammogram, we understand that it can be a scary and overwhelming process. But we want to assure you that the screening is quick and painless for most women. Keep reading to learn more about mammography and call our Atwood hospital today to schedule a screening. According to the American Cancer Society, women between the ages of 40 and 44 should begin having regular breast cancer screenings. Women between 45 and 54 should get a mammogram once per year. And women who are 55 and older can switch to getting a screening once every other year. If there is a history of breast cancer in your family, you may want to talk to your doctor about being screened with MRI in addition to having an X-ray screening. How Do You Complete a Self Examination? In addition to getting a yearly or every other year screening, women should also complete self-examinations. These should be done once every month and should also be taken seriously. Before you get out of bed in the morning, or in the shower, raise your left arm above your head, and with the right hand using medium pressure, use your fingers to inspect the tissue around the entire breast area and the armpit. Complete this process on the other side and consult with your local hospital if you feel anything abnormal. Don’t wear deodorant: Because a mammogram scans the entire breast area as well as the armpit, ingredients in deodorant can interfere with the final images. If you do wear deodorant, it can show up on the image as white spots, which can be hard to distinguish from white cancerous spots. Schedule the screening two weeks after your period: The breast tissue tends to be tender and slightly swollen during menstruation, so the process may be more uncomfortable if the tissue is sensitive. Know your family history: Before the actual screening takes place, the doctor will ask about your family’s health history. Keep in mind that even if no one in your family has had breast cancer, there is still a risk of developing it. The more thorough a history you can provide, the better. What Does Getting a Mammogram Involve? Breast cancer screenings are generally a fast process (about 15 to 30 minutes), so there shouldn’t be anything to worry about. You will be given a gown and asked to undress from the waist up for the imaging. The technologist will take two images of each breast, one from the top and one from the side, making a total of four images. 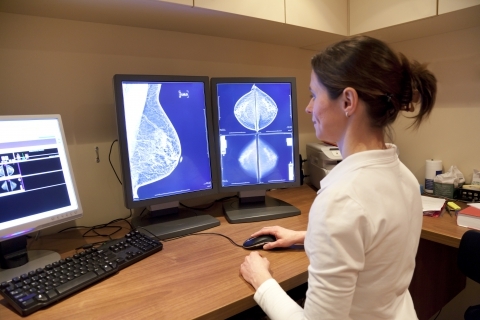 Mammograms are X-rays of the breasts and during the screening, each breast will be placed in between two plates, which then compresses the tissue in order to get a clear image. The plates may be cold to the touch, and you may experience some uncomfortable pressure, but few women experience pain. Mammograms give off a very small level of radiation and are completely safe. What Happens After a Mammogram? After the mammogram is complete, you will receive a letter in the mail usually within 30 days. If you are called and asked to come into the hospital to review the results, it does not mean you have cancer, and in fact, this is fairly common. It simply means that they have found something suspicious. It could be a cyst or a tumor. If there is a tumor, it may need to be biopsied, but this still does not mean you have cancer. During a biopsy, a small amount of tissue is removed in an out-patient procedure. The results from this will tell whether or not the tumor is cancerous or benign, or not cancerous. If you’re over 40 years old and have not yet had a mammogram, get in touch with our hospital staff to schedule an appointment today. The best way to prevent breast cancer is with regular screenings and self-examinations. Contact Rawlins County Health Center in Atwood today. Kyle and Barb Herspring, physician assistants at Rawlins County Health Center will be leaving the Atwood Community and relocating to Wichita sometime in June 2019. “We thank both Kyle and Barb for helping to build a great system of care for the community, and we understand the value and appreciate the need for the Hersprings’s to focus on the importance of family first,” remarked Ron Robinson, CEO. For here for the full press release. With Thanksgiving a week away and Christmas and New Year’s a month or so away, the holidays have officially arrived. Along with the holidays comes parties, pot-lucks, cold-weather colds, busy shopping malls, and traveling. With all of the commotion of the season and plates of cookies, it can be hard to stay healthy and motivated to make time to exercise and eat right. That’s why Rawlins County Health Center wants to get in ahead of time with some friendly tips on how to stay healthy the next two months. Our medical center provides cardiac health services, diabetic services, laboratory services, and more. As much as we love treating our patients, we want to keep as many people as healthy as possible during the holidays. So as you’re hopping from family party to office party, keep these tips in mind. This is no doubt one of the busiest times of the year, making it hard to fit in the recommended 30 mins of exercise a day. But if you want to avoid the holiday-15, make it point to at least do something every day that involves movement. Take the stairs at work, go for a walk during lunch, take your dog for a walk after work, do jumping-jacks before you get in the shower in the morning — every little bit of exercise can make a big difference at the end of the day. When traveling for the holidays or going to parties, healthy fruits and vegetables can be hard to come by. If you know that you’re going to a party that night, eat a satisfying salad for lunch. Toss in some tuna or chicken with avocado, peppers, broccoli, and something sweet like raisins or dried cranberries. For a filling side, grab a handful of almonds. If you’re looking for healthy snacks, try a bag of baby carrots and some hummus. Getting in at least some veggies throughout the day will give your body essential nutrients. It’s easy to think that you can lose a few hours a night or two during the week because of an event, but this will quickly catch up with you. Too little sleep will eventually start affecting your immune system. With a weak immune system, when you are exposed to a virus, it will be harder for your body to fight it off. This is especially important if you are traveling or spending time at other people’s homes. Watch out for door handles, faucets, and watch who you’re shaking hands with. If you happen to catch a cold, be sure to cover your mouth when you cough or sneeze, wash your hands frequently, and don’t feel guilty about having to stay home from an event. Staying home is better than infecting 10 other people. 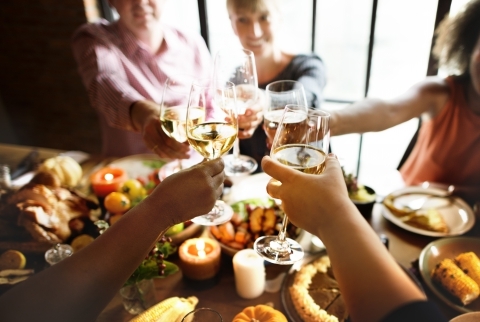 If you know you’re heading out to a party that will have a table full of fatty and sugary foods, try to get in a healthy meal before you leave. You can still have a little snack or dessert at the party, but you won’t feel like you have to fill up your plate with unhealthy treats. If you’re trying to watch your calories this season, keep an eye on what you’re drinking. Many alcoholic drinks are full of calories and then all of a sudden you’re well over your daily calorie budget. Beer, wine, and hard ciders are alcoholic drinks with the highest calories. Liquor like rum and gin are good options when mixed with tonic water or club soda. If you truly are on the go and can’t manage to get in some vegetables, at least take a daily multivitamin. It’s a quick and easy way to give your body some nutrients to keep you out of the doctor’s office. Look for one with vitamin C, D, magnesium, zinc, and B-12. But keep in mind, a multivitamin shouldn’t be used as a substitute for healthy living. The doctors and staff at Rawlins County Health Center want you to enjoy your holidays! But we also hope that we don’t see you at our medical center — no offense. If you are feeling ill or need urgent care, please visit us in Atwood on Grant Street. We take pride in giving our patients the best care year round. 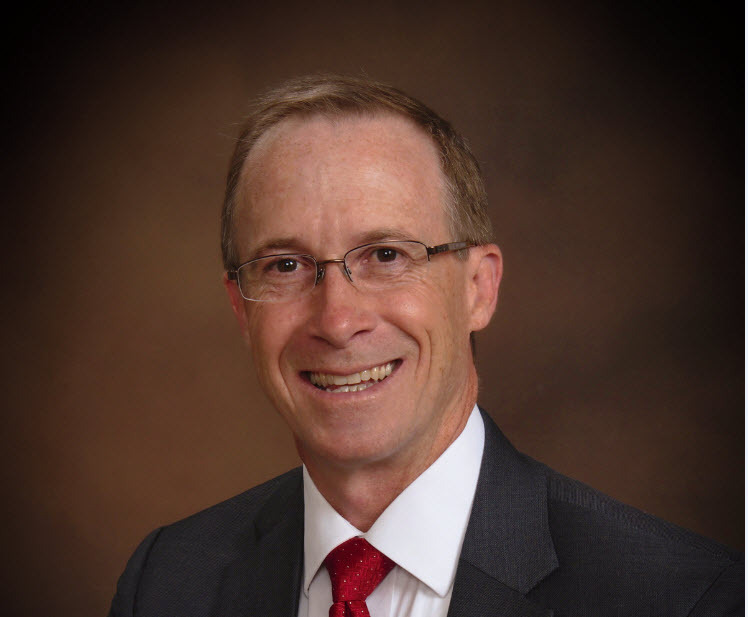 Rawlins County Health Center and Centura Health, the largest health ecosystem in Colorado and western Kansas, along with Goodland Regional Medical Center announced that Ronald Robinson, MD, MPH, MBA has accepted a new combined position as Chief Executive Officer and Chief Medical Officer for both Rawlins County Health Center and Goodland Regional Medical Center effective December 17, 2018. Dr. Robinson began his service with Centura Health as a practicing physician in 2003, and has served in multiple leadership roles including; medical director of surgical services, chief of staff, and CMO at Centura’s Avista Adventist Hospital in Louisville, CO. His education and experience have led him to a unique position for this very challenging and innovative role. Beyond his medical degree, Dr. Robinson also holds a Master of Public Health, and a Master of Business Administration. He is board certified in both anesthesiology and aerospace physiology and has served as a flight surgeon at NASA as well as a medical officer in the Air National Guard and the U.S. Navy, where he still serves as a Lieutenant Commander. Click here for the full joint press release.